کارشناسان ترویج فعال در عرصه عملیاتی، باید دارای یک‌سری صلاحیت‌های ضروری باشند تا بتوانند برنامه‌های آموزشی با کیفیت، مرتبط و مهم را به جامعه روستایی ارائه کنند. در همین راستا، تحقیق حاضر به‌منظور واکاوی مؤلفه‌های صلاحیت حرفه‌ای کارشناسان فعال در عرصه عملیاتی ترویج کشاورزی استان مازندران انجام گرفته‌است. روش تحقیق توصیفی- پیمایشی است. جامعه آماری این تحقیق شامل کارشناسان سطح عملیاتی ترویج کشاورزی به تعداد 290 نفر بوده‌است. نمونه‌گیری طبقه‌ای با انتساب متناسب و با استفاده از جدول کرجسی-مورگان 165 نفر به‌عنوان نمونه آماری تعیین شدند. ابزار تحقیق پرسشنامه‌ای محقق ساخته بود که روایی محتوایی آن بر اساس نظر متخصصان ترویج و آموزش کشاورزی تأیید شد و پایایی آن با استفاده از ضریب KMO و آماره بارتلت مورد بررسی و تأیید گردید (737/0KMO=). نتایج تجزیه تحلیل داده‌های تحقیق نشان‌داد که هفت عامل استخراج شده (پژوهشگری، فنی-تخصصی، آموزشگری، مدیریتی، شخصیتی، ارتباطی، تکنولوژی‌های مجازی)، در حدود 691/63 درصد مقدار کل واریانس مربوط به صلاحیت‌های حرفه‌ای کارشناسان سطح عملیاتی ترویج کشاورزی در استان مازندران را تبیین می‌نماید. با توجه به یافته‌ها، جهت آشنایی با روش‌های علمی پژوهش، نیازسنجی، برنامه‌ریزی و ارزشیابی، اجرای کارگاه‌های آموزشی ضمن خدمت برای کارشناسان، ضروری به‌نظر می‌رسد، همچنین بهبود مهارت‌های عملی مروجان در انواع کشت محصولات کشاورزی و کار با نرم افزارهای کاربردی کشاورزی در برنامه‌های سازمان جهاد کشاورزی توجه ویژه گردد. 3M.Sc.Student in Agricultural Extension and Education and Member of Young Researchers Club, Sari Branch, Islamic Azad University, Sari, Iran. Extension experts who play an active role at the operational level are required to have some indispensable competencies to enable them to provide the rural community with some high quality, ­applicable and important educational programs. Accordingly, the study sought to analyze the components of professional qualifications for agricultural extension experts’ operational level. This study is a descriptive and survey research. The statistical population (Agricultural Extension Experts in Operational Levels) was comprised of 290 persons. And the proportional stratified sampling using Krejcie-Morgan Table was applied and 165 subjects were selected. The data collection tool was a researcher-made questionnaire, and its content validity was approved by agricultural extension experts and by using KMO coefficient and Bartlett’s Test giving a reliability of )KMO=0.737(. The data analysis results showed that seven extracted factors of (research factors, technical-professional factors, teaching factors, managerial factors, personality factors, communication factors and virtual technology factors) explain 63.691% of the total variance of the professional competencies for agriculture extension experts’ operational levels in the province. The findings indicate that based on scientific methods of research, assessment of needs, planning and assessment, and in-service training workshops implementation for experts seem to be necessary. Distinctive attention should be practiced by Agriculture Organization to improve agents’ skills in a variety of crops cultivation and in working with software and agricultural applications. اسدی، ع.، موسوی، س.، سعدی، ح. و پیش بین، ا .1382. صلاحیت­های مورد نیاز مروجین امور دام. مجله علوم کشاورزی ایران، 34(2): 333-344. چیذری، م.، حسینی، ج. و یاری بیگی، ا. 1387. بررسی صلاحیت­های حرفه­ای مروجین پیرامون توسعه­پایدار کشاورزی. ماهنامه کشاورزی و غذا، 67: 54-58. رضایی، ر.، قدیمی، ع.، اسحاقی، ر. و ودادی، ا. 1391. بررسی صلاحیت­های مورد نیاز مروجان کشاورزی از دیدگاه پرسنل ترویج کشاورزی استان اردبیل. مجله تحقیقات اقتصاد و توسعه کشاورزی ایران، 43(3): 473-482. سیاهی، ح. 1386. بررسی صلاحیت­های حرفه­ای و آموزشی مروجین امور دام جهاد کشاورزی استان ایلام. پایان نامه کارشناسی ارشد، دانشگاه آزاد اسلامی، واحد علوم و تحقیقات. عابدی سروستانی، ا .و زمانی، غ. 1385. روش های ارتباطی در ترویج منابع طبیعی (مطالعه موردی: استان فارس). علوم کشاورزی و منابع طبیعی، 13(5): 125-139. عبد الله زاده، م. 1379. نقش ارزیابی کارکنان در بهبود عملکرد نیروی انسانی. پایان نامه­ی کارشناسی ارشد منتشر نشده، دانشگاه تربیت مدرس، تهران. نامدار، ر.، پزشکی راد، غ.، چیذری، م. و زمانی میاندشتی، ن. 1389. بررسی صلاحیت‎های حرفه‎ای تحقیق‎مداری مورد نیاز ارزشیابان وزارت جهاد کشاورزی. مجله تحقیقات اقتصاد و توسعه کشاورزی ایران، 41(3): 313-321. American Society for Training and Development. 2006. Bridging the skills gap: How theskills shortage threatens growth and competitiveness and what to do about it [White paper]. Retrieved from the American Society for Training & Development website: www.astd.org /NR/rdonlyres/D43B0459-E5F9-4BC09275FA33FF927637/0/SkillsGapWhitePaper.pdf. Visited: 2011/02/05. Bartram, D., Robertson, I. T. and Callinan, M. 2002. Introduction: A framework forexamining organizational effectiveness. In Robertson, I. T., Callinan, M. & Bartram,D (Eds. ), Organizational effectiveness: The role of psychology, 1–10. Brown, T. G. 1981. Changing delivery systems for agricultural extension: The extension teacher- changing roles and competencies. American Journal of Agricultural Economics. 63: 859-862. Cavallo, K. and Brienza, D. 2001. Emotional competence and leadership excellence atJohnson & Johnson: The emotional intelligence and leadership study. Retrieved fromthe Consortium for Research on Emotional Intelligence in Organization’s website. www.eiconsortium.org/pdf/jj_ei_study. pdf. Visited: 2009/08/05. Cooper, A. W. and Graham, L. 2001. Competencies Needed to be Successful County Agents and County Supervisors. Journal of extension. 39(1). Article rb3. www.joe.org/joe/2001february/rb3.htm. Visited: 2006.01.19. Debnath, A. Saravanan, R. and Jayasree D. 2014. Job Competence and Job Performance of the Extension Personnel of the Department of Agriculture in Tripura State of North-East India. International Journal of Social Sciences, 3(2): 91-112. Extension Committee on Organization and Policy Personnel and Organization Committee. 1992. Implications for motivational strategies: The 21st Century Extensionprofessional in the midst of organizational change. Washington, DC: Author-UnitedStates Department of Agriculture. Gibson, J. D. 2003. Use of managerial proficiencies in agricultural and Extensioneducation: An assessment of Virginia Cooperative Extension. Journal ofInternational Agricultural and Extension Education. 10(3): 19–24. Jahi, A. and Newcomb, L. H. 1981. Orientation: adjust for agent characteristics?. Journal of extension. July/August, 1981. Karbasioun, M., Mulder, M. and Biemans, H. 2007. Towards a Job Competency Profile for Agricultural Extension Instructors – a Survey of Views of Experts. Human Resource Development International. 10(2): 137-152. Lakai, D. 2010. Identification of Competencies Needed by the Extension Agents in North Carolina Cooperative Extension. A thesis submitted to the Graduate Faculty of North Carolina State University in partial fulfillment of the requirements for the degree of Master of Science. Lakai, D., Jayaratne, K., Moore, G. and Kistler, M. 2014. Identification of Current Proficiency Level of Extension Competencies and the Competencies Needed for Extension Agents to Be Successful in the 21st Century. Journal of Human Sciences and Extension. 2(1): 71-89. Lopokoiyit. C. 2011. Professional Competencies of Agricultural Extension Agents in Kenya; Implications for Curriculum Development. Department of Agricultural Education and Extension. Egerton University Kenya. Innovation in extension and advisory services international conference. Maddy, D. J., Niemann, K., Lindquist, J. and Bateman, K. 2002. Core Competencies for the Cooperative Extension System. [Report]. Retrieved from: Personnel and Organizational Development Committee (PODC) of ECOP: podc.unl.edu/finalPODC.pdf. Visited: 2012.08.03. Massey, L. C. 2004. A framework for building management capability in New Zealand. Journal of Small Business and Enterprise Development. 11(2): 13- 22. Megan, M., Mc Clure, N., Fuhrman, E. and Morgan, A. 2012. Program Evaluation Competencies of Extension Professionals: Implications for Continuing Professional Development. Journal of Agricultural Education. 53(4): 85–97. Murphy, T. and Bruening, T. 2006. A cross-national study of agricultural extension and education competencies. Journal of International Agricultural and Extension Education. 10 (1): 51-59. Nurul, H. 2015. Open & Distance Learning (ODL) and Agricultural Extension Workers’ Social Competence in Indonesia. Journal of Education and Learning (EduLearn). 9(1):17-24. Olsen, L., Bhattacharya, J. and Scharf, A. 2006. Cultural competency: What it is and why itmatters. California Tomorrow. Retrieved from. . www.csueastbay.edu/ceas/departments/el/files/docs/cultural_competency.pdf. Visited: 2012/11/05. Oven, M. 2004. Defining key sub- competencies for agricultural extension workers. Journal of Extension. 44 (2): 33- 39. Pezeshki rad, G., Yoder, E. and Diamond, J. 1994. professional competencies needed by extension specialists and agents in iran. Journal of international Agricultural and Extention Education, (1): 46-53. Project management institute. 2004. What else the pm knowledge competencies the individual and organization need to learn. Sharifi, M., Hosseni, M., Iravani, H. and Sharifzadeh, A. 2011. Factors influencing facilitation competent of agricultural extension experts. 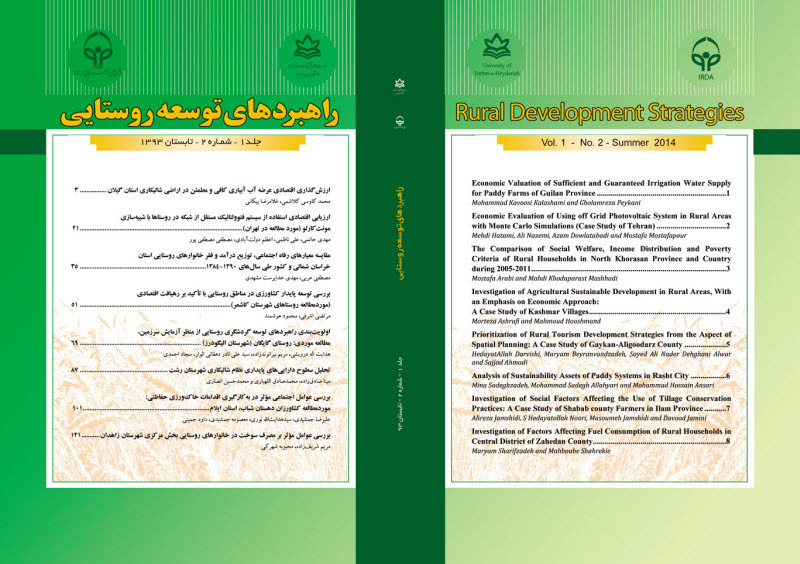 Journal of Iranian Agricultural and Development Economics Research, 41(2): 243- 255. Stone B. B. 1997. A system's approach to professional development. Journal of Extension[On-line], 35(2). 2TOT2. Retrieved from http://www.joe.org/joe/1997april/tt2.php. Visited: 2013/09/25. Stone B. B. and Bieber S. 1997. Competencies: A new language for our work. Journal ofExtension [On-line], 35(1). 1COM1. Visited: 1997/08/05. Trede, L. D. and Whitaker, B. S. 2000. Educational needs and perceptions of Iowa beginningfarmers toward their education. Journal of Agricultural Education, 41(1): 39–48. Zorzi, R., Perrin, B., Mc Guire, M., Long, B. and Lee, L. 2002. Defining the benefits, outputs, and knowledge elements of program evaluation. Evaluation Canadian Journal of Program, 17(3): 143- 150.